ATOS is using the Cloudify powered alien4cloud to accelerate application development, DevOps practices, and a digital transformation at Société Générale. The NTT DATA INTELLILINK Corporation, has chosen Cloudify’s open source cloud-native orchestration platform as a preferred TOSCA orchestration framework and is now offering Cloudify to its IT systems integration customers throughout the world. 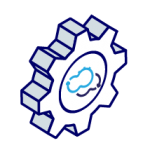 Cloudify can be utilized to orchestrate OpenStack or other on-premise cloud infrastructure, public clouds such as AWS and Azure, and other infrastructure technologies such as Docker containers and more. The company is one of the largest reinsurance companies in the world and offers a wide range of primary and health insurance products to businesses and private individuals as well as asset management. This tier-1 reinsurance company has big data computational requirements for actuarial calculations which are performed against a diversity of databases constantly. These databases run on nearly 600 OpenStack VMs, and need to continually be managed, monitored, and upgraded all while enabling continuous integration and development in testing and production environments. Cloudify enabled this company to deploy databases on demand, manage them, upgrade them as needed through a simple application blueprint while tying all of the pieces of the infrastructure and application together. The complex architecture contains a management portal to request environment provisioning, an existing IaaS orchestrator that sends JSON requests to Cloudify, a DNS/DHCP that receives the IPs, OpenStack cloud, NetApp storage, Chef for application deployment, alongside 6+ backup and monitoring tools. Providing hundreds of services under three main business lines, two retail and one wholesale banking. Their services include digital banking, lending, investing, asset management, insurance, and more. The organization was facing challenges with accumulating too much technology, in business silos, that was not standardized and was fragmented across business units. The need to create a single source for their diversity of technology, along with a deployment model that was easily consumable yet scalable, by developers and operations alike across hybrid stacks and infrastructure. With Cloudify the bank was able to receive environments on demand, being able to spin up entire app environments at the click of button, and then tear them down, making them ephemeral & DevOps friendly - provisioning of front end, back end, queuing, storage - which formerly was quite complex. Cloudify was evaluated against Juju and Terraform, and was chosen due to its flexibility, and control over the entire lifecycle compared to other products - with strong API support, a DSL for manifest language and blueprint, as well as being able to define the application lifecycle management - even within a compute node on a specific process. Cloudify provided the full end-to-end solution they were looking for. The work of the Cloudify team enabled technology standardization across the entire business and all LOBs, in a multinational corporation, ultimately lowering the bank’s costs by 40%, enabling them to deploy over 5000 nodes on OpenStack in production, helped them introduce over 50 new digital services and technologies to their internal end-users and clientele, and seven new platforms, all in under one year. Belgium’s largest telecommunication company, Proximus, the leading provider of telephony, internet, television and network-based ICT services selected Cloudify as a part of a multi-vendor team tasked with helping the company implement a next-generation, virtualized cloud network. Cloudify provides the NFV management and orchestration and assists with the onboarding and deployment of virtualized network functions (VNFs) including F5, Palo Alto, Huawei, Nokia, and multi-cloud with OpenStack and VMware. Telstra leveraged the development and deployment of an open source software based national SDN & NFV network to also spearhead the transformation of its engineering and operation teams and their methodologies. Cloudify is proud to be serving as the TOSCA Service Orchestrator in this cutting-edge project. This is an award-winning solution, receiving the Network Transformation, Culture & Diversity Award at the SDN & NFV World Congress, 2017. Partner Communications, a leading Israeli Telco group, selected Cloudify and VMware to launch its new vCPE and SD-WAN solution called V-NET. Based on the open-source TOSCA standard, V-NET was delivered through a unique, cloud-native approach to network service orchestration using an agile/incremental approach referred to as "orchestration first." The approach focuses on designing and deploying the NFV orchestration and automation capabilities first atop the company's existing network infrastructure (physical or virtual). New virtualized network services can then be deployed in days or weeks rather than months. This is an award-winning solution, receiving the Network Transformation, Cloud & Carrier Service: Best vCPE/uCPE Enterprise Service at the SDN & NFV World Congress, 2017. Cloud native communications software leader Metaswitch and Sprint are automating NFV management and orchestration (MANO) increasing service agility and reducing service-affecting manual errors. Metaswitch is OEMing Cloudify’s virtual network functions management (VNFM) capabilities in the delivery of its own VoLTE TAS, vSBC and vIMS VNFs and the two companies are collaborating closely in customer engagements, bridging gaps in operators’ NFV MANO systems. With Cloudify as the VNF Manager (VNFM) and using a TOSCA-based blueprint as the topology, the NetNumber TITAN Master is deployed onto OpenStack, or any other cloud. Cloudify makes it possible to automatically on-board the TITAN Edge nodes and connects them to the Master, and this edge architecture can be applied to any distributed, federated edge networking use case. Once deployed, Cloudify also automates scaling or healing of the nodes as needed based on metrics with policy management, and as with any Cloudify blueprint, this process is always repeatable. VoLTE TAS, vSBC and vIMS VNFs and the two companies are collaborating closely in customer engagements, bridging gaps in operators’ NFV MANO systems. This solutions demos how to create a container service in Kubernetes, and deploy an orchestrated VoLTE service at the edge of the network with VMware (VMware Integrated OpenStack), Affirmed, MetaSwitch, and Ixia in a distributed MEC design. Our partners at HCL built a live demo of a 5G network slicing implementation concept leveraging Cloudify to onboard HCL’s OpenAirInterface vEPC services over multiple containerized OpenStack clouds and end-to-end orchestration of each network slice. What’s more, this implementation was built on open standards components, including ETSI MANO. The solutions provides orchestration for centralized management, flexibility in application deployment and multi-tier service modeling, along with a multi-layer approach - important in large organizations for responsibility support matrix. Cloudify and Fortinet have been partnering closely through the Fortinet Fabric Ready partner program. Cloudify has built a solution with Fortinet to deliver TOSCA-based security orchestration for their best of breed security appliances. Cloudify makes it possible to deliver dynamic services for all Fortinet VNFs across any cloud environment. A joint solution was built by 6WIND and Cloudify where Cloudify Manager serves as the VNF Manager and NFV Orchestrator functions for the 6WIND vRouter. 6WIND’s virtual appliances are instantiated on OpenStack, and OSPF routing and IPsec VPN tunnels are configured, deployed and orchestrated by Cloudify with TOSCA based templates. The solution is then monitored by Grafana out of the box or any other pluggable monitoring platform of choice. Using Cloudify’s open source automation manager, Cyrus will be fully automated and orchestrated in accordance with ONAP. Cloudify Manager detects a policy in the blueprint that meets the condition, and automatically triggers a healing workflow. If Cloudify Manager detects an overload of resources, then it automatically triggers a scaling workflow and adds more capacity.